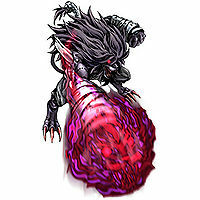 A berserker who lost its intelligence and enhanced its combat instinct. 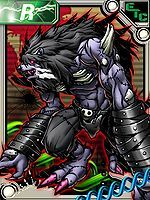 Although it was originally a Lion Digimon, it heaped modification upon modification and arrived at its current appearance. In the process, its consciousness vanished, and it became nothing more than a puppet that defeats those standing before it, as it is commanded. Because it doesn't act or think according to its natural instincts, it exhibits headlong assaults, heedless even of any traps or gadgets. Although it is fundamentally high-powered, its patterns are meager, with nothing but primitive attacks such as hitting and kicking. Nevertheless, caution is necessary, because its sharp claws bear a deadly poison which can cause anything to rot away. Speaking of what seems to be its only Special Move, it fires its "Spirit" in the shape of a lion's face (Jūoudaken). The lion-faced spirit which it fired bites the flesh off of those standing in its way as it flies through them. A berserker who lost its intelligence and enhanced its combat instinct. 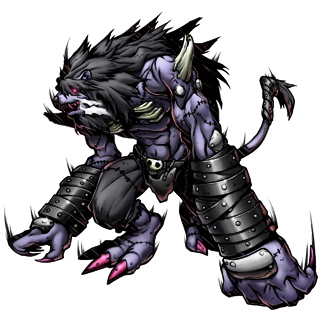 Although it was originally a Lion Digimon, it heaped modification upon modification and arrived at its current appearance. Its patterns are meager, with nothing but primitive attacks such as hitting and kicking. but caution is necessary, because its sharp claws bear a deadly poison which can cause anything to rot away. Its "Jūoudaken", which fires its spirit in the shape of a lion's face, bits the flesh off of those standing in its way as it flies through them. adj.,1. mentally disturbed; deranged; insane; demented. adj.,2. enraged; greatly provoked or irritated; angry. Jūoudaken  Fallen Beast King Fist 獣王堕拳 N/A Beast Blaster Hurls energy in the shape of a lion's face, which flies out and bites through anything standing in its way. 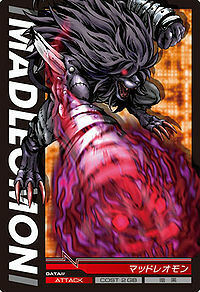 Fudokusou  Necrotoxic Claw 腐毒爪 N/A Poison Claw The claws on both of its hands contain a deadly venom that causes decay. Mad Leomon is a member of the Bagra Army and is currently in charge of taking over Green Zone. 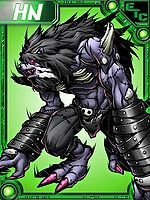 He absolutely hates humans and despite being a good enough tactician to be placed in charge of many troops, thus far he is consistently defeated by Xros Heart. This same Mad Leomon is later resurrected as a regular Leomon. 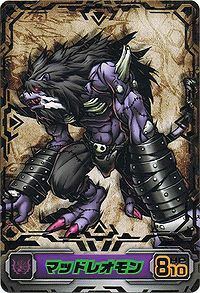 A deranged Digimon that, in its pursuit of strength, continually modified its body and gained the power of a berserker, while losing its own consciousness in the process. Following orders, it swings its poisonous claws and relies solely on its strength. 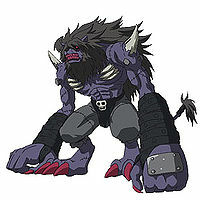 Mad Leomon is an enemy Digimon in the Blastmon challenge. 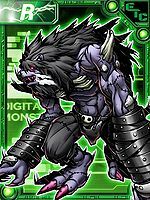 ↑ Digimon Xros Wars: "Glorious DigiXros, Seize it! Our Future!!" ↑ Digimon Xros Wars: "Taiki and Kiriha VS the Bagra Army, An All-out Showdown!" ↑ Digimon Xros Wars: "Shoutmon, Roar!" ↑ Digimon Xros Wars: "Rival Kiriha, Appear!" ↑ Super Digica Taisen: "Blastmon Challenge"
This page was last modified on 28 December 2018, at 15:22.